Olympus has extended its cashback offer on the premium XZ-1 compact camera. Customers who buy the camera before the end of February can claim £40 cashback. The Olympus XZ-1 is the company's top of the line compact and offers a number of advanced features including the ability to shoot in raw format and full manual control. It also features a digital iZUIKO wideangle 28-112mm (35mm equivalent) lens with a maximum aperture of f/1.8 at the wide-angle end, which is especially designed to help with shooting in low light situations. A manual lens ring allows for quick adjustment of key camera settings when shooting, while a sliding depth-of-field adjuster is also included. With 10 million pixels, the 1/1.63 inch CCD sensor is the largest of the popular enthusiast-level compact cameras, making it larger than equivalent rivals from Canon, Nikon and Ricoh. Other specs include HD video recording at 720p, an in-built pop-up flash, high speed shooting at up to 7fps at full resolution, or 15fps at 1.2 million pixels. It's worth noting that you should shop around for the best price for the XZ-1 in the first place, as price difference can sometimes be up to £100. 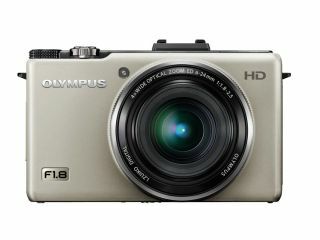 See our Olympus XZ-1 review for a list of best prices. The cashback offer is running in the UK until 29th February 2012, and is valid on purchases made from authorised UK and Ireland stockists. More information on the offer and now to claim the cashback are available at the Olympus website.